I am excited to announce an updated UI and new functionality in the Hakiri web app. We collected a lot of feedback from our customers in the past few months on how the web interface is being used in the real world and what the major pain points are. As it turns out, confusing scan results on multiple screens was one of the biggest issues for a lot of people. The underlying logic behind our screen hierarchy matches this pattern: project » branch » scan » warning. We used to show actual scan results on all pages except for the warning pages, which was confusing as there was no clear differentiator for those pages. The second thing that customers brought up was how hard it was to get a 10,000 foot view of the build history. They wanted to see what direction their builds were trending in. In other words, they wanted to answer the following question: are we fixing our security issues or do they keep piling up every day? They also wanted to quickly identify failed and timed out builds in that list. 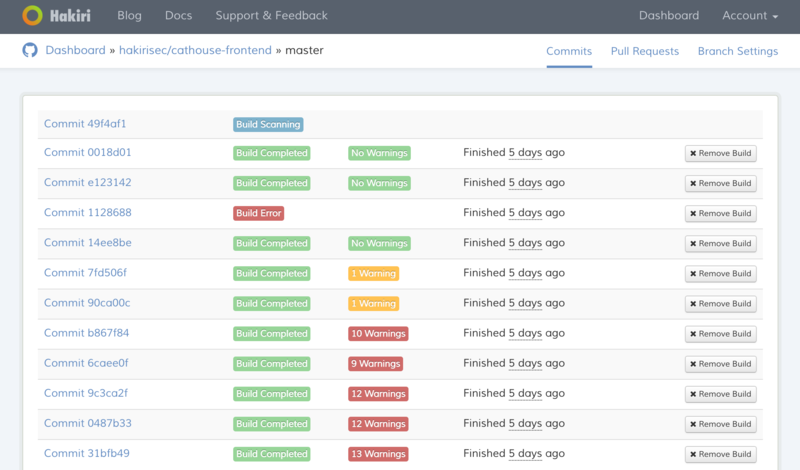 We addressed both of those pain points by changing project and stack views to only include the list of recent builds with clear labels for the number of warnings and the status of each build. Another thing that we optimized is the use of space at the top of every page. We decided to collapse several navigational elements like breadcrumbs and several view specific buttons into a secondary navigation bar. This change decluttered all web app views, made navigation more streamlined, and saved vertical space. 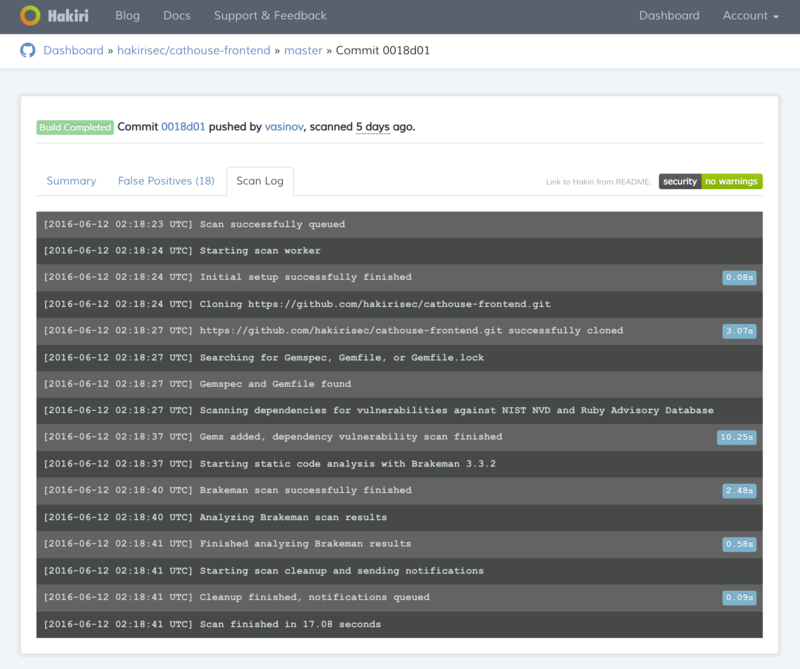 Finally, we added scan logs to all new builds. Now you can see what Hariri is doing in the background whenever it’s scanning your commit or pull request and how long individual stages of the scan are taking. If the scan failed or timed out the logs indicate which stage it failed at and provide some helpful debugging information. If the failure is still not clear we are always around to help: hello@hakiri.io.